Did you catch Archie Panjabi and Jack Davenport as married couple the Harcourts in Next of Kin’s first episode last night? If not, catch up on ITV Hub today. In early scenes that had us gripped, Archie Panjabi is in a taxi stopping suddenly in a traffic jam. A cyclist swerves to miss her, as she steps out into the chaos on the road. A plume of black smoke indicates the gridlock is due to an explosion, a terror attack, and soon this is confirmed. 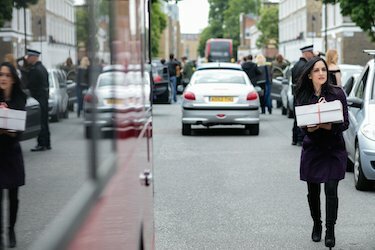 Using a helicopter, emergency services vehicles, a bus, cars and pedestrians, the scenes were filmed with 120 cast and crew in Islington along Linton Street, Rees Street and St Philip’s Way in May last year. Things take a very dark turn, and soon the Harcourt family is under suspicion by counter terrorist officers. During their research for the six-part series, its creators Paul Rutman and Natasha Narayan, spoke to Sara Khan of Inspire and the Muslim Chaplain, Kalsoom Bashir who are combatting radicalisation among young people. They were also advised by Commander Richard Walton, formerly director of Counter Terrorism Command. The creators have said, “The world of Kalashnikovs and Jihad, of Anasheed videos and apostasy, has as much to do with this family as the Salem Witch Trials have to with a modern Anglican. So when this world collides with their own, their reactions quickly turn from grief to denial: this can’t be happening, it can’t be happening to us. FilmFixer manages the film office service for Islington, Lewisham, Southwark and Camden councils. FilmFixer director Karen Everett says, “We can see why the production is hoping this drama will get people talking, and we were really happy to help out with the location filming. “Some of the locations might looks familiar. Jack Davenport plays a political lobbyist, with his office in Freemason’s Hall in Camden. And the Counter Terrorism Unit is played by another familiar place, the Blue Fin Building in Southwark. “Some very important scenes were filmed over four days in a location we see far less of – the stunning period cinema Gracepoint on Essex Road. “An old limousine pulls up out the front, as we see celebrities making their way along the red carpet into the cinema. A few scenes were filmed from the rooftop, as well as interiors. “It was also great to see Lewisham’s stunning Broadway Theatre on Catford Road used, where a death is being investigated. “Rotherhithe Primary School in Southwark hosted filming in May last year, where parents and children celebrate an international food evening. “Islington’s South Library on Essex Road doubles as a mosque where we see ritual washing and a prayer scene. Whittington Community Centre in Islington is used, and the Mildmay Club in Stoke Newington plays a Muslim community centre. “Eden Grove in Islington makes an appearance and the interior of the British College of Osteopathic Medicine, in Camden’s Netherhall Gardens. Certainly the locations feel very familiar and homey to Londoners, adding an even more uncomfortable edge to the drama.